Those who learn the science of life with the view of gaining knowledge in material media, pharmacy, pharmacology and therapeutics have to study in the preliminary stage Nighantu books (Sort of eastern ancient dictionaries), which are composed of names and effects etc. of the Vegetable Kingdom, Mineral Kingdom and Animal Kingdom. The earliest medical practitioners who were eager to gain a thorough idea in medical knowledge looked down these books as useful for gaining that end. As grammar is essential to certain extent to become scholar, the nighantu is of same interest to become a physician. Not only that, these people who were eager to better the future generations with the above knowledge complied several books, they are: Rajanighantu, Dhanvantharinighantu, Madanapalanighantu, Kaiyadevanighantu, Nighantusara sangraha, nighanturathnakara, nighantuchandrodaya, Dravyagana darpana and Dravya-guna Sangraha. 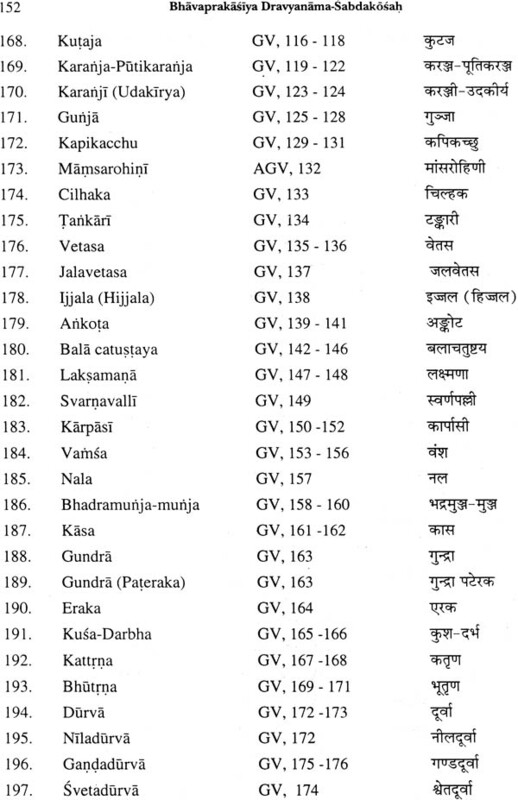 Each and every one of these books, which are written in Sanskrit language, was both in India. There are several Sanskrit nighantu books in other countries where eastern medical science was spread. Among them both Saraswati nighantu and Siddhaushadha nighantu was compiled in Ceylon. There is another nighantu named Wanawasa nighantu composed of Snighalese verses. In other Sinhalese namavalu granthas and the nighantu named Abhidhanappadeepika, which is composed of Pali Stanzas, there are names and synonyms of subatances. There are several Sanskrit books in India which can be ranked to those above. I take this opportunity to show my gratitude to those compilers who were of paramount importance to the physicians to achieve their ambition. Though, other books are of importance I can say without the least doubt that Bhavaprakash nighantu the middling part of Bhavaprakasha of Erudite of Bhavamishra take a prominent place by putting down all the other nighantu granthas. This book is of great help to the students and practitioners of Ayurvedic medical science. Though in comparing with the present we infer that this book is in composed in various things. This is so, when we compare this book with a book called Materia Medica, we can see with our own eyes how far this is genuine, but it reigns in the Sanskrit Materia Medica (=Dravya namaguna nighantu) world. Though it is imbedded in the Bhavaprakash, now this book is established as a separate volume named Bhavaprakash nighantu. By this book each and everyone has the facility to understand the names and effects of the substances. But when we come across an unpopular name of a drug, it is very difficult to search it from this book, which is composed of verses and the ancient method. Because it is very Laboursome to find out whether it is a synonym to name of a drug or it is in what stanza or in what chapter. In realizing these herds' peps, which are among the novices and the practitioners of science of life, I intended release these people from that difficulty. Consequently, this dictionary composed in the new method is made available to you all to clear your doubts. The Sanskrit language has spread in the oriental language like the salt in a curry. Hindi is a popular language in India. Now the government of India has decided to make it the state language and the Nagari alphabet, which is used to write Hindi in known by educated class of various countries of the universe. Now it is on the verge of becoming the Sinhalese the state language. But it is not world famous language, and it is only used in Ceylon. This language is a complication of mainly the Pali and Sanskrit including eighteen Oriental languages and which was started simultaneously with the Buddhist era. There are very many medical books written in this language. Sinhalese people are an Aryan race of Lala in India who migrated to Ceylon. In the earliest stages they divided themselves into eighteen castes with eighteen languages respectively. All these language complicated to form a new language. Now it is obvious to you the causes namely homogeneous roots in Indian languages in Singhalese. There are an immense number of words that have shadows of those languages and classical Singhalese verbs are very contrarary to the colloqual Singhalese and these verbs follow the method of their mother tongues. Ninety nine percent of Singhalese community is the followers of Buddhist religion, which was born in India and brought to Ceylon. The combination between Ceylon and India is very like that of daughter and mother. 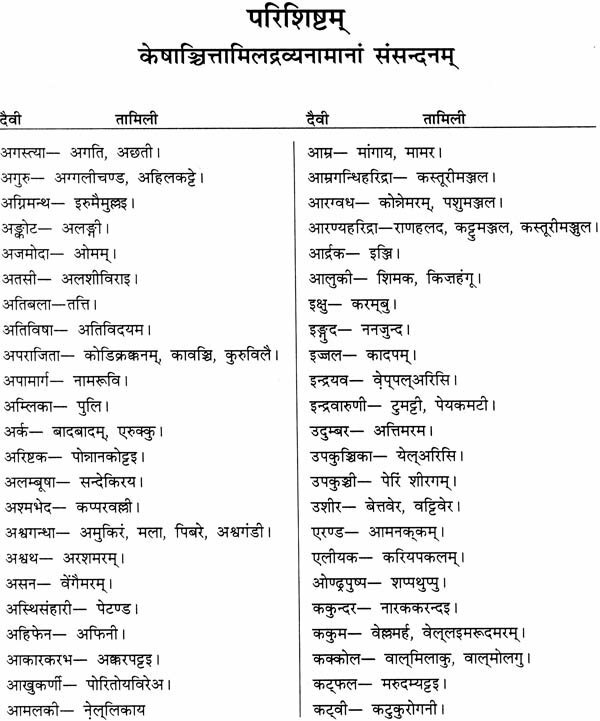 Hence in writing the Singhalese equalents to Hindi names will be great use not only to Singhalese people but also to the other people in various occasions. There is no necessity to introduce the English language because it is like the wind that is enveloping the whole surface. If there is a person who does not know what is English, he should be pointed out. This book is compiled with the names of the drugs pertaining to the above four languages. 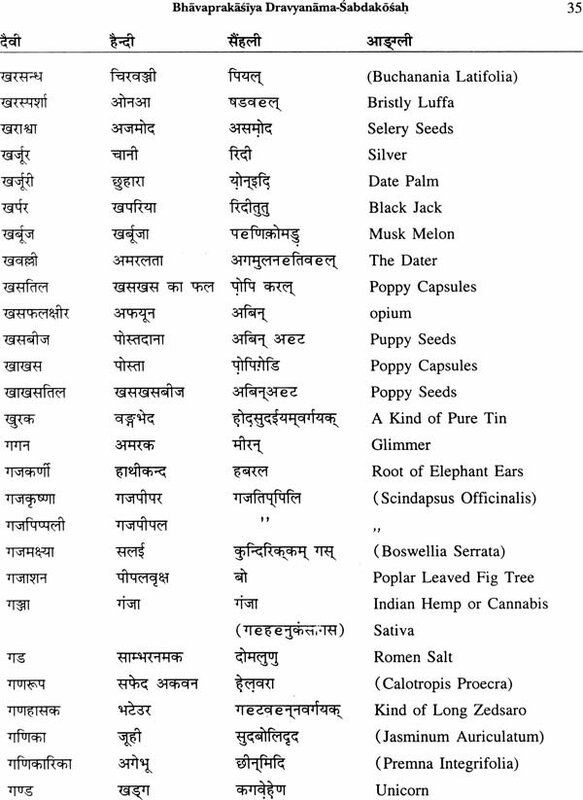 The first line is composed of the names of drugs, which exist in Bhawaprakasa Nighantu in the alphabetical order and in other three lines there is equivalents of other three languages respectively. 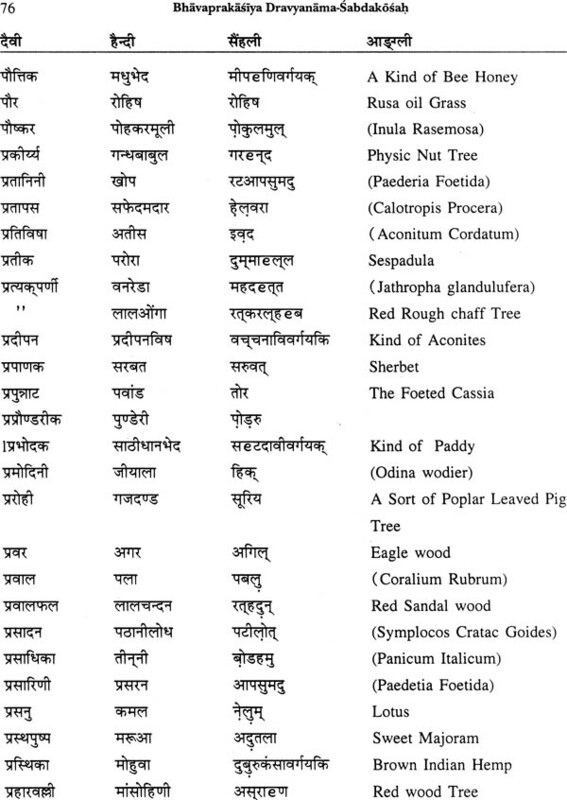 I had to go through an ardous road in finding the appropriate Sanskrit equivalents. In several places my attempts were in vain. In such places I used the words of the mother tongue. In this occasion do not neglect that the words of the mother tongue are found in the daughter language very same as that of the mother tongue. I exerted myself very much in finding the English equivalents to the such drugs. In places where my attempts were in vain I was forced to substitute Latin equivalents which is a mother tongue of the English and which is known by the persons who know western medical science. By doing so I was able to fill the places, which were left blank. 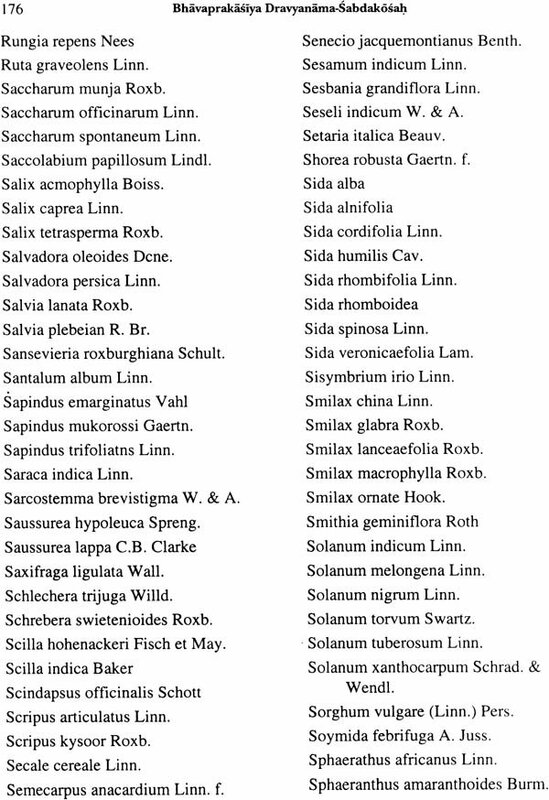 As there were several synonyms to a drugname; I used English equivalents in one or two places. I purposely used Latin equivalents with the view of rendering a service; such places are showed in brackets. In places where I could not find words I showed it with a dotted lines. I will undertake to fill these blanks later. To alleviate your exertions. I have compiled the Tamil equivalents in the appendix. With the comparison of various names of drugs with the equivalents I think this book would be of help to certain extent in deciding the undecided drugs of various countries. Some letters pertaining to the Singhalese alphabet are unable to write in Nagari letter. Course of this are namely there are no both of short half combinations of letters and palatals letter. In case of writing eye and a langa ye' have to such the help 'e' and dot to write several Singhalese words. Those dots should not be misunderstood as that Hindi which used show a sort or pronunciation. I can not certify that there are no more amendments in this book because I was fully occupied with the work of medical collage and dispensary and also I was unable to see the proofs before the beginning of the printing. If there is any such error I will try my level best to correct them in another occasion. In the complication of this I sought help from many books. Here I give merit with my heart to the authors of those books and I acknowledge my indebtedness. Here I take the opportunity to express my grateful thanks to very Rev. Dharmakeerthi Sri Dharmawasa chief high priest of southern Ceylon and the head of mahamanthinda Pirivena matara, Ceylon and ven'ble Saddharmakeerthi Sri Pragnathishya of Magallagoda the Principal of above pirivena and the vice high priest in charge of the Court of the brotherhood of the southern Ceylon; and also to Rev: Sri Hemaloka of walgama the vice Principal of foresaid Pirivena whose were assistant in gaining my knowledge in oriental languages and also ayur: Dr. R.H.P. Vaidyasekara and his late father native physician and popular astrologer R.C. Fernando of Siriveda Nivasa Unavatuma, Galle, Ceylon who were help to me in my medical studies, and also master Amarasena Sooryakeerthi who prompted to prepare this book and also Chowkhamba Sanskrit Series Office of Varanasi which has financed the printing and circulation of this book. I express my sincere well wishes all of them.